In July 1969, the Parkes Observatory claimed a place in history, when they received television transmissions of man’s first steps on the moon. At 12.56 pm on Monday 21 July 1969 Australian Eastern Standard Time (AEST), one giant leap for mankind was taken. CSIRO’s Parkes radio telescope received television signals that allowed six hundred million people, one fifth of humanity at the time, to watch Neil Armstrong’s first steps on the Moon. But it was not plain sailing. While fully tipped over waiting for the Moon to rise, the telescope was struck by a series of severe, 110 km per hour gusts of wind, which made the control room shudder. The telescope was slammed back against its zenith axis gears, a dangerous situation that threatened the integrity of the telescope structure. Fortunately the winds abated and Buzz Aldrin activated the TV camera just as the Moon rose into the telescope’s field of view. The Parkes radio telescope began tracking. NASA’s Goldstone station in California. When NASA was switching between the images, it found that the Parkes pictures were of a superior quality, so this footage was used for the remainder of the 2.5 hour telecast. 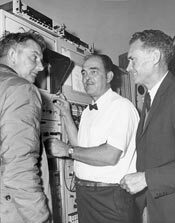 Following the mission the NASA Administrator, Thomas O. Paine, sent the following message of commendation to the Australian Minister for Education and Science, Mr Malcolm Fraser: ‘I wish to express my sincere appreciation to you and the Commonwealth Scientific and Industrial Research Organisation for making available the Parkes facility during the Apollo 11 mission. Its participation, and spectacular performance, provided the entire world with a chance to experience, with astronauts Armstrong and Aldrin, this historic event’. Before the mission, John Bolton had agreed to a one-line contract with NASA: ‘The Radiophysics Division would agree to support the Apollo 11 mission’. In meeting his commitment to NASA, both he and the staff of the observatory displayed great nerve and courage in their decisions and ensured that mankind was able to witness the historic event with the greatest possible clarity. For five magnificent days in July 1969, the Parkes Observatory contributed to the success of the greatest voyage of discovery and achievement in the history of science. As it tracked Apollo 11 on its journey to the Moon it was, in a sense, carried along on Eagle’s wings.